Chances are, by Boxing Day, the last thing you feel like doing is more cooking to cater for the hoards. 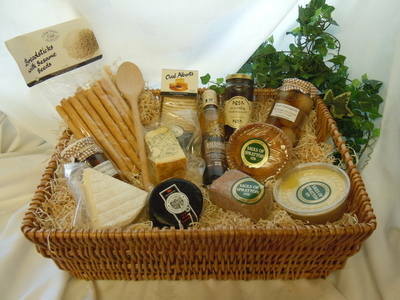 This hamper contains a selection of our award-winning home made produce, a range of delicious cheeses, pickles and chutneys and some tasty nibbly bits to accompany all this delicious festive goodness. Make this a Christmas present to yourself so you can have the day off. Or treat your friends or family, so you know that wherever you visit on Boxing Day, you'll eat like a king (or queen!) Beautifully presented in a quality wicker basket, cellophane wrapped and trimmed with raffia bows, this gorgeous hamper is Christmas sorted! Please order by Dec 1 for collection. If you would like to order ten or more, please call the shop for more information and special offers.